The Obama administration is refusing to accept the disastrous dynamics it has set in play with its monstrous health overhaul law. Instead of recognizing the economic reality of what they’ve done, officials are railing at the companies and industries that are responding in perfectly rational ways to the incentive structures they have set up. Here’s the latest avalanche of bad news for consumers who surely will not “be able to keep the coverage” they have. The Iowa-based company provides coverage to about 840,000 people who receive their insurance through an employer. Principal is just the latest in a long list of insurers to announce plans to drop coverage. It may have dropped it anyway, but ObamaCare undoubtedly accelerated the decision. 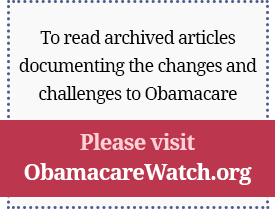 The plans can’t meet the requirements of new regulations that HHS is writing to implement ObamaCare. Because McDonald’s has relatively high employee turnover, it spends more on signing people up and other administration than the new rules will allow (85% medical care and 15% admin). The plans are called “mini-meds” and offer limited coverage, but it’s coverage that allows people to go to doctors, get their medicines, preventive care, etc. The new rules “would deny our people this current benefit that positively impacts their lives and protects their health,” McDonald’s said in a memo to HHS. “There is not any issuer of limited benefit coverage that could meet the … standards,” said Neil Trautwein, vice-president of the National Retail Federation. Millions more policies are at risk for employees of Home Depot, Disney, CVS, Staples, Blockbuster, etc., the Journal reports. 22,000 New England seniors can’t keep the coverage they have. Harvard Pilgrim announced this week that it is getting out of the market for Medicare Advantage in response to the massive cuts coming to this popular program. These policies offer more comprehensive benefits than traditional Medicare to seniors, most of whom have modest incomes but who don’t have retiree coverage or can’t afford expensive Medigap policies. ObamaCare targets the most vulnerable seniors, dumping them back into the fee-for-service market where they are likely to have a very difficult time finding a physician to see them — all so the government can get private plans out of Medicare. Why, we wonder, don’t they target AARP’s sweet deal for the private Medigap plans it markets, raking in hundreds of millions of dollars in royalties that it can use to lobby for ObamaCare? Child-only policies vanishing: HHS Secretary Sebelius is angry with a number of insurers for announcing they plan to stop offering child-only insurance policies. But does she really not get it? If you tell companies they must sell to anyone who applies, even if the children are already sick, then it simply is not a sustainable insurance or business model. And when one company in an area announces it plans to stop offering the policies, that creates instant adverse selection for other companies that remain in the market, setting off a cascade of dropped policies. The cascade began just a few days after ObamaCare was signed into law this spring when AT&T, Caterpillar, John Deere, Verizon and several other large employers said the law would take a bite out of their future earnings. They were about to be hauled before the House of Representatives to explain their disloyalty until it became clear that they were likely to testify that they also are considering dropping employee coverage. After that, we learned that retiree medical coverage was in jeopardy. Next, there was another casualty of ObamaCare — the fledgling insurance company in Virginia, nHealth, that shut down after investors concluded it wasn’t possible to navigate the maze of new regulations and succeed. Do they not understand the wreckage is the fault of ObamaCare? And this is only the beginning as thousands and thousands more pages of regulation will further disrupt virtually every aspect of our health sector. The president tried to quiet a woman raising concerns about the health overhaul during another of his most-unpresidential-like backyard forums this week. The woman voiced fears that ObamaCare turns us toward England’s socialized medicine where care is rationed and even denied. The president gave a scripted answer that didn’t answer her question and clearly showed how irritated he was. Another lawsuit: A December 9 hearing date has been set in Tyler, Texas, for a lawsuit brought against ObamaCare by Physician Hospitals of America and the Texas Spine and Joint Hospital. The law says that physician-owned hospitals that serve Medicare patients can no longer expand after March 23, 2010. The PPACA also bans any new physician-owned hospitals from providing services to Medicare/Medicaid patients if the facility is not Medicare certified by December 31. The Texas hospital had a $27 million expansion well underway when ObamaCare passed, but won’t be able to meet the deadline. Scott Oostdyk, lead counsel for the plaintiff, said the law unfairly amounts to retroactive legislation, a principle found unconstitutional by earlier courts. The law singles out physician-owned hospitals, which he says is exclusionary and a violation of due process and equal protection of the law. Let’s debate: The Benjamin Rush Society, organized to help young doctors and medical students see the wisdom of a market-based health sector, sponsored the eighth in its series of campus debates on Wednesday night. Sally Pipes, the indefatigable president of the Pacific Research Institute, gets huge credit for launching BRS and for helping to give young minds a chance to hear both sides of the debate. Jeff Anderson of PRI and I debated two physicians arguing for single-payer health care. I will write up my opening statement and post it here at some point this weekend. BRS needs your support for the good work they are doing. Medicaid briefing: And please join us this coming Thursday for a briefing on Medicaid & ObamaCare: The impact of the health overhaul law on the states. We’d love to have you join us on Capitol Hill in the beautiful new Capitol Visitor Center, beginning at 9:30 a.m. It’s free and you can sign up here. Sally Pipes, president and CEO of the Pacific Research Institute and author of The Truth About ObamaCare discusses what’s really on the way courtesy of the recent health overhaul law: higher costs, decreased access to care, and the looming specter of a single-payer system in America. The Medicare payment system rewards quantity at the expense of quality, Fodeman writes. Medicare pays hospitals and doctors 71% and 81% respectively of private rates. Ultimately, the brunt of Medicare’s stinginess is passed on to patients in the form of decreased time with providers and compromised quality of care. This declining reimbursement puts further pressure on doctors to see more and more patients to maintain the same income. In the years to come, ObamaCare inevitably will give the government greater market share in the health care sector. This will only accelerate the trend toward hospital discharge one day post-surgery and further undercut the patient-doctor relationship. The Repeal Pledge is a new campaign to ensure that “repeal and replace” is something more than a political slogan, The Wall Street Journal writes. It is modeled after the famous taxpayer-protection pledge of Americans for Tax Reform, which helped to steel opposition to antigrowth policies. The repeal pledge aims to do the same for ObamaCare, and has been signed so far by 43 Republicans. The pledge applies beyond repeal per se to interim steps like discharge petitions to allow certain up-or-down votes in Congress on partial repeal, stripping funding from some ObamaCare subsidy or enforcement programs, and repealing certain regulations. The larger GOP opportunity is to pursue genuine health care reform now that the public has so decisively rejected the entitlement model that Democrats have favored for several political generations. That begins with unraveling ObamaCare, and the hard political slog ahead could use an accountability tool like the repeal pledge. The health overhaul law has set in motion a government takeover of American health care, and a very hostile one at that, Capretta writes. The Obama administration’s clumsy and overbearing behavior since its passage proves the point. Massive bureaucracy. Disinformation campaigns. Blatant power plays. The politicization of decisions that should be made with a focus on patient care. The use of government power to threaten citizens and their livelihood. That is what ObamaCare has brought us. And that’s just in its first six months. When Do Rules for the Common Good Cross the Line? At what point is the common good bad for people, asks Parker. Many so-called Everyday Americans who live in the oft-maligned red states essentially are people who live in more-open spaces and, therefore, see little need or benefit for government management of their lives. The frontier may be nearly gone, but the person who prefers wider horizons will have little use for bureaucrats bearing the latest government how-to (or how-to-not) document. Inevitably, the mind wanders to health care and other government programs that aim to do nice things for people but in the process eliminate the options of being self-directing individuals. Heavy-handed warnings and demands that insurers get on the ObamaCare bandwagon are alienating both the health care industry and the public, Matthews writes. HHS Secretary Kathleen Sebelius is upset that critics are accusing her of “thuggery” for her recent cease and desist order sent to health insurers. Some insurers have been notifying their policyholders of future premium increases. Insurers have had to factor in all the new benefits that President Obama and Sebelius have been touting. The health overhaul legislation requires lots of new health insurance benefits — benefits that come with a cost. But Democrats sold it by telling people they would get more and pay less. It was a lie, and now HHS Secretary Kathleen Sebelius has to fain shock at the price increases. Rationing in America has started, Pipes writes. By December, the Food and Drug Administration is expected to revoke approval of the drug Avastin for the treatment of advanced breast cancer. The FDA claims its decision won’t be based on cost, but Avastin isn’t cheap — a full regimen costs about $100,000 a year. Avastin has proven to be a wonder drug for countless women with stage IV breast cancer, but when no significant increase in “overall survivability” was reported this summer, an FDA advisory panel recommended that Avastin’s approval be withdrawn. But no cancer drug has ever been taken off the market based solely on “overall survivability,” Pipes writes. Traditionally, calculations of a drug’s effectiveness have been based on tumor response and progression-free survival rates. If the FDA strips Avastin of its approval, it’s likely that private insurers and Medicare would stop covering the medicine, effectively removing it from the anti-breast cancer arsenal. President Obama recently put forward an economic proposal that the whole country should be able to get behind, Pitts writes. Its core competent is expanding the research and development tax credit. This move builds on the legacy of Ronald Reagan, who introduced the tax credit in 1982. Mr. Obama’s proposal would allow companies to take a 17% deduction above 50% of R&D costs. That’s a significant increase over the previous 14% rate, and the credit would be made permanent, allowing businesses to make better long-term plans and invest in new research with confidence. A bigger and permanent credit would boost the pharmaceutical industry, help create new, life-enhancing drugs, and drastically cut down on overall medical expenses. According to a 2010 study by the Milken Institute, increasing this credit by 25% and making it permanent would add $206.3 billion to GDP and raise total employment by 510,000 jobs within a decade. Rep. Paul Ryan’s “Roadmap for America’s Future” has a better shot at reducing future Medicare outlays than past efforts, Cannon writes. The Roadmap would give enrollees a voucher with which to purchase insurance. Sicker and poorer enrollees would get larger vouchers, and the average voucher would grow more slowly than Medicare spending has grown in the past. The voucher system would also put downward pressure on prices across the entire spectrum of care. Income-adjusted vouchers would also change the game on the “patient” side, by diminishing well-to-do enrollees’ incentive to lobby for higher Medicare spending. Vouchers are the most plausible way to restrain Medicare spending. They are also the most humane way, because they let enrollees retain the benefits that mean the most to them. Ryan is the only member of Congress taking this problem seriously. Employers can expect 2011 health care cost increases to be at their highest levels in five years due to recent higher medical claim costs, an aging population and changes brought about by health care reform, according to an analysis by Hewitt Associates. Next year, Hewitt projects an 8.8% average premium increase for employers, compared to 6.9% in 2010 and 6% in 2009. Hewitt estimates that the most immediate applications of the health overhaul law — including covering dependents to age 26 and the elimination of certain lifetime and annual limits — contributed approximately 1% to 2% of the 8.8% projected increase for 2011. According to Hewitt’s analysis, the average total health care premium per employee for large companies will be $9,821 in 2011. The amount employees will have to contribute toward this cost is $2,209, or 22.5% of the total health care premium, up from 12.4% in 2010. Grace-Marie Turner will participate in a panel discussion on “Relevant Reform: Covering Health Care in a Way that Matters” on Tuesday, October 5 from 3:30 p.m. – 4:30 p.m.
U.S. Healthcare Reform: Universal Insurance or Affordable Care? For more information, contact RegulatoryStudies@gwu.edu.